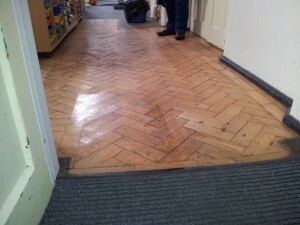 This is a school dining hall wood parquet floor in Oxford, and this particular part is a high traffic walk through area which as you can see has become very soiled, dull and tired looking. 1) This process will be more beneficial to them and the children over sanding, as no sanding = no dust and no mess. 2) Protection that lasts – the finish is twice as durable as other conventional wood finishes. 3) More convenient and less disruptive – The job can be completed in less time and the room will be ready to use in less time due to the quick drying finish. 4) More affordable and economical – If the floor was professionally sanded, the price would be considerably more PLUS they would have the cost and inconvenience of a cleaning contractor to clear away the dust. We offered them a FREE demonstration of our system so that they could see the results. They opted for a satin finish. See bottom photo: We cleaned the square at the entrance and applied the finish to the section on the left. As you can see, the floor has been greatly improved with the dirt etc removed and a lovely satin finish. If the whole floor is done, some stunning results will surely be achieved!! 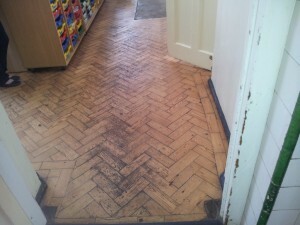 With a maintenance plan in place, they should avoid the need for floor sanding again! If you need some wood floor restoration in Oxfordshire and would like a FREE quotation and demo (if necessary) on your wood floors. 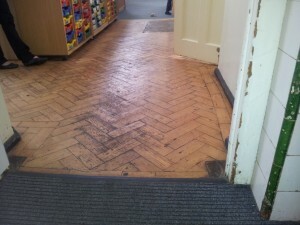 Contact Floor Restore Oxford Ltd and we would be happy to help!